If any part of this specs. sheet is wrong, please PM me and I will fix it. *Note - this is for US & Canadian models. 1.9gallons not 1.9qts for cooling system capacity. Last edited by Prelude13; 07-24-2008 at 08:17 PM. I really really appreciate the links at the bottom!! Those links really helped me alot. Thanks man! Man, this is great! Gonna help me a bunch when I get my wife's '86 si this weekend...got a broke Defrost/Hazard switch I have to replace. Thanks a ton for the manuals, I couldn't find them anywhere online!!! wonderful information. just what i needed. 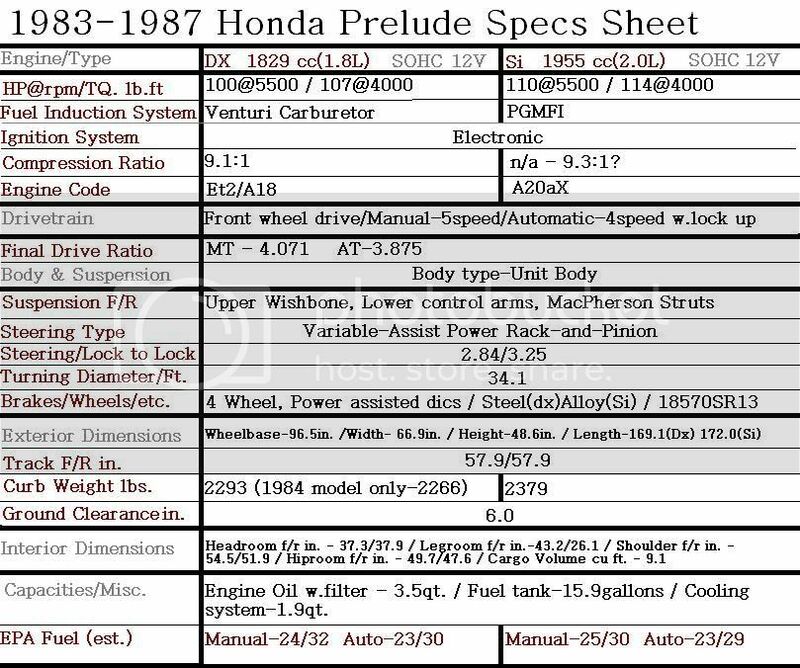 i have an 86 2.0Si with some minor problems but needed spec info to get all i can get and make it last. I´m from Germany. Nice Information, so I can look what´s difficult about the European cars. My car is an 1984 Prelude 1.8ex with ALB. PERFECT INFO BEEN LOOKIN FOR THIS INFORMATION ALL WINTER THANKS A LOT. NOW I CAN GET MY CAR FIXED...AWSOME. Wow, Thank you so much for this and the links, They helped me out a bunch! I KNEW I should have looked here first. I JUST Bought a 87' Prelude and wanted to get some service manuals for it. I did the same with my old 91 Eclipse. Anyway, thanks for the links. There are a few issues that need to be tended to before I take her out. Edit: Mr Fountain, I'm just a few towns over from you, in Puyallup. Nice to know there is at least one local around here. u know the usual thank you! is this manual for 2.0 si or the 1.8 engine. if so, are there any differences as to the mounting of the starter? The 2nd gen SI weight was 2480 lbs and its torque peak of 114 ft/lbs occurred at 4500 rpms. Early versions of the A20A1 (before Honda changed their engine nomenclature) were known as the BT. Rep'd for seaching... and taking great efforts to preserve a peice of automotive history. Last edited by bykfixer; 08-31-2013 at 02:05 PM. This will save my life. Just got a rough 87SI. She needs love. And the service manuals are exactly what I was hoping to find.